Bob Abdalla pastors a church on the outskirts of Kisumu. It is a medium to low income area with many needy and vulnerable people, especially widows and children. The church members have raised enough funds to send eight children to school but there are a number of others who just cannot get there. There are also many widows who need to be able to generate some income for themselves and their families. BHW is already assisting some of them to do that (KEN13). This project is a small scale income generation activity to generate income to support the vulnerable in the community in which Pastor Bob lives and pastors a church. The church has been assisting vulnerable widows and children to get to school and start up small businesses with some success but they desire to start their own income generation to increase the resources available and enable them to assist more people. The plan is to build a chicken run in Bob's home village, Nyakach, some 3 kms from Kisumu. A person he knows there will operate the little business and be paid for doing it. The funds will come back to the church to care for the physical needs of the vulnerable. BHW's New Partnership Facilitator has known Bob and Lillian Abdalla since 2005 when Bob was part of the team at MCO-OCC (KEN01b) and a church planter and pastor with them in Kisumu. He first met Bob when BHW introduced MCO-OCC to Harvest Partnership (INT05) and we were involved in training their people. Since that time he has caught up with Bob on numerous occasions and in 2009 BHW provided funds to enable them to re-establish their tailoring and materials business after it was destroyed in the post-election violence. We have remained in contact and during a visit to Kenya in 2016 Pastor Bob alerted us to the needs in this community. In May 2017 funds were provided to commence an embroidery business (KEN13) and then in October 2017 this chicken income generation project was commenced. 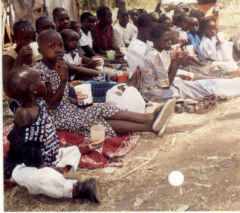 The children who cannot get to school and the widows who have the capacity to operate a small business. It is with a partner we already know and trust who has a holistic understanding of ministry. It is a church based initiative so there is leadership and accountability. The focus is the poorest and most vulnerable people in the community. 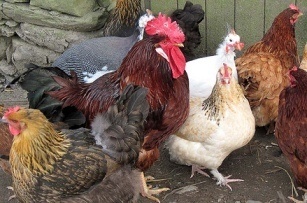 Those running it have experience with chickens and there is a ready market nearby. Bob and Lilian have three children, one girl and two boys. Bob is a pastor and a church planter. In 2005 he was trained in church planting movement (CPM) although had planted a number of formal churches including the church in Kisumu prior to that. Following the training he began a number of churches in houses as a means of reaching out from the formal church. The progress has been such that he leaves the main church for most of the month and travels to train other leaders and to share his experience about multiplying churches through home outreach and discipleship centers. His work takes him to churches around Kenya and neighbouring countries. 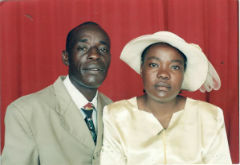 Lilian lost her mother before her marriage and was exposed to the practical experience of loss of parental love. She saw the widows in the church and the community struggling to survive and developed a passion for holistic development, both spiritual and physical. She mostly works with women who are despised by society making them more desperate, especially at times when they lose their husbands. Lillian and Bob mobilize and train them with skills and they are encouraged to establish small enterprises and income generating activities. To produce enough eggs to financially support the ministry to the poor in their church and the community. The strategy is to care for laying chickens and then use the profit generated to assist these people and their loved ones. Hopefully before long there will be a regular income flowing in which will see children able to get to school and an increasing number of widows making a living for themselves. Initially the chicken run will be built. One month later 50 x 1 month layer chickens will be purchased and then six months later another 50 chickens will be purchased. This will be the only funding required. It will then provide a regular income to the church to support children and women who are vulnerable. The total budget required here is US$1,665. This includes $660 to build a chicken run and the balance will buy the one-month old chickens and feed them until they are laying.